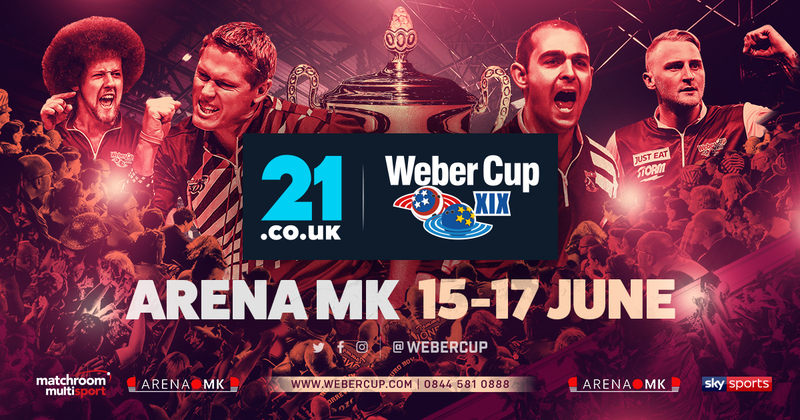 Online casino brand 21.co.uk will title sponsor the 19th annual Weber Cup, the Europe vs. USA tenpin bowling showdown to take place at Arena MK, Milton Keynes from June 15-17, live on Sky Sports. Europe have won the last five 21.co.uk Weber Cups but America have brought back two legends of the lane – Chris Barnes and Tommy Jones – as they attempt to wrestle the famous trophy back from the hosts. Played over five sessions, there are a maximum of up to 37 matches – a mixture of singles, doubles and team ‘Baker’ matches – with the first team to 19 wins taking home the trophy. Matchroom Sport Chairman Barry Hearn commented; “We are delighted that 21.co.uk will title sponsor tenpin bowling’s biggest event. Team USA are determined to take the trophy back to America again, but Europe are on a hot streak at the 21.co.uk Weber Cup and have a team that knows how to win this tournament. The European team will be captained by England’s Dominic Barrett. He is joined by countryman Stuart Williams and Martin Larsen and Jesper Svensson, both of Sweden. Team USA sees Chris Barnes return as captain, with Tommy Jones set for a record 11th appearance in the event. Fan favourite Kyle Troup is back, with 21-year-old PBA Tour rising star Anthony Simonsen making his 21.co.uk Weber Cup debut. The 21.co.uk Weber Cup is tenpin bowling’s answer to of golf’s Ryder Cup as two four-man teams from Europe and the USA compete over three days in a series of singles, doubles and baker format matches. The 21.co.uk Weber Cup will be staged over five sessions – 6.30pm Friday 15th and 12.30pm and 6.00pm on Saturday 16th and Sunday 17th. The tournament will be produced by Matchroom Sport television and broadcast live on Sky Sports as well as other channels around the world. Tickets for 21.co.uk Weber Cup XIX are on sale now at www.webercup.com or by calling 0844 581 0888. Tickets are priced from just £11 per session or £42 for a season ticket, with concession rates available. A family season ticket can be purchased for just £99. 21.co.uk is the leading online casino for those seeking the excitement of the casino on their desktop, mobile or tablet. From the thrill of Live Blackjack and Live Roulette tables to the classic entertainment offered by the best online slots in the business including Rainbow Riches and Starburst, 21.co.uk has something for everyone. Plus with a choice of welcome bonuses and some seriously sizeable jackpots, the suave and sophisticated site is sure to deliver an online casino experience like no other.